Our sweet little scruffy terrier (Rio) was competing for attention once his little human brother (Vir) arrived to be a part of his pack. Rio was so sad for the first few weeks that he wouldn’t even look at Vir nor accept sitting next to him. We knew from there on that Rio needed time and space to realize that his baby brother will be his new playmate very soon and so we laid out the groundwork to build a loving relationship between both our babies. In my previous post When Our Fur Baby Met Our Son I spoke about our relationship with Rio and how we introduced him to our new born. I also discussed how he reacted with the presence of a baby in the house in the initial months. Fast forward 6 months, today Rio and Vir have come close to forging a friendship. Getting them off to a good start took some work! And in this post I will be discussing about how it was all worth it. Its true kids love their pets; these creatures large or small teach, delight and offer a special kind of companionship. If you see my amusing Instagram stories, you know how both of them play around the house, compete for attention when daddy is back from work and laze on the couch or bed looking at story books. Vir is still young to understand his boundaries with the dog, and we are glad that Rio can handle the exciting little monster rushing behind him. I know over time both my babies will learn to respect each other and there is a good chance they will be best of pals. But this loving scenario is only possible by doing your best to foster a relationship between them. 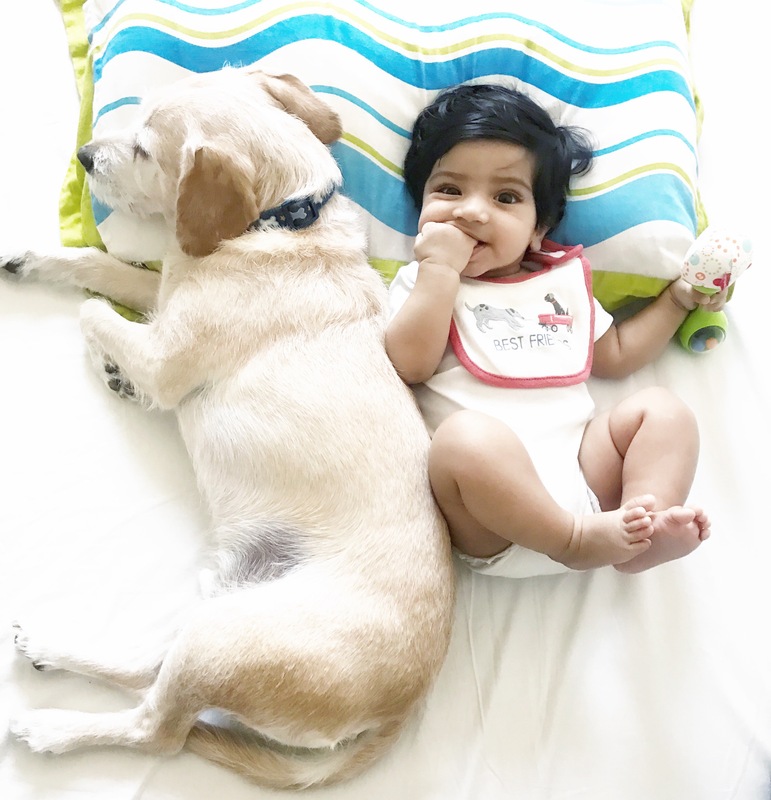 Below I am sharing few of my Tips and Tricks on how we worked on our child and dog’s relationship. I hope this helps all parents who are either planning to get a dog for their children or are looking for some advice on how to handle their dog when their new baby comes home. We started to socialize Rio with kids at the park so his fear of them goes away. Often kids tried to pet him but he would run away. But, with time his fear ran away. While I was pregnant I started to say the word “Baby” to Rio so he gets used to it. I often pointed towards my tummy and asked him to put his paws on my belly. When I returned home with Vir for the first time, I first met Rio and greeted him for 10 minutes until he was relaxed. Post that I took Vir in my arms and allowed Rio to smell his feet. As mentioned earlier we kept a close watch on Rio when he was in the same room as Vir. We never left him alone with the baby especially for the first month. I ensured that Rio still had his space as before. He was sleeping with us in our bed as always. (Vir slept in the crib next to our bed) He was allowed in the nursery and if there was no room on the couch for him or anywhere next to us, we would let him find his own space. I didn’t want to confuse him and at the same time didn’t want him to lose his discipline around the house. I kept a watch out for any signs of aggression from Rio, especially when Vir is around trying to chase him. I always reward him with treats for all positive reactions and firmly say “NO” in case there is any unwanted behavior. At least once a week we take Rio for his outing with the family in the car to a dog park, coffee shop or even at our friend’s place so that he feels loved and secured. We had success in training Rio to respect the baby, his toys, his food and his space. Yet I have more work to do with Vir, to teach him to respect animals. Our son is too young to understand this concept, but we ensure that he doesn’t hurt Rio by poking him or hitting him. In time I look forward to teaching Vir to stroke Rio gently and explain that Rio’s tail is not a toy to pull. Once Vir starts to walk and carry tiny objects in his hand, I want him to start caring for Rio by offering him water and food in his bowl. I am aware that the learning process involved for both Rio and Vir in building a friendship and lifetime bond will take some time. But the thought of Vir and Rio playing with a ball or strolling at the park together while enjoying each other’s companionship melts my heart and makes this wait tad bit harder. 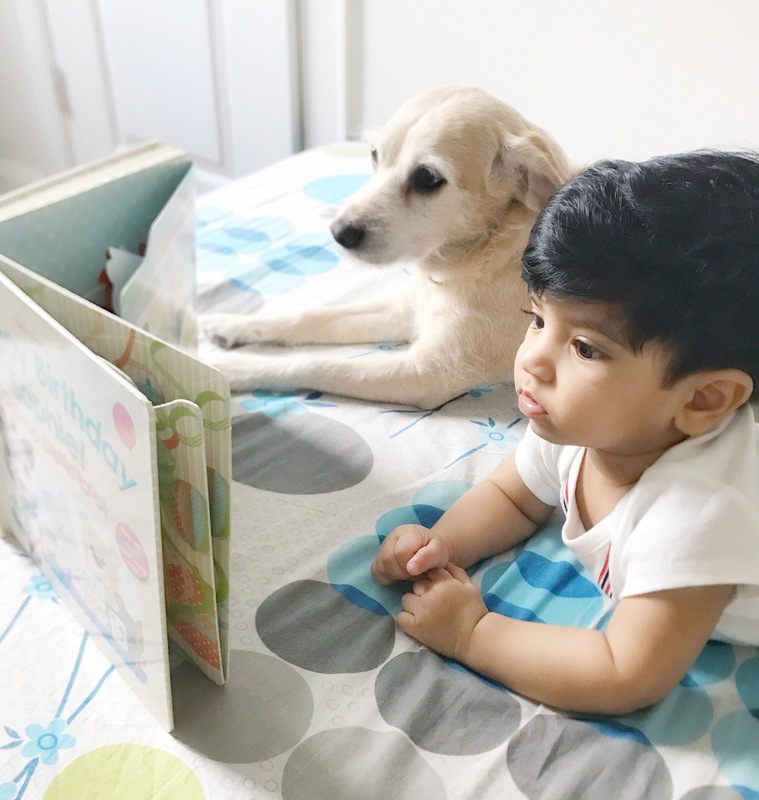 In the mean time I plan to give my dog and the kid the best chance for a successful relationship by taking deliberate steps to create a kid-loving dog and develop empathy and respect in Vir. So adorable! My daughter absolutely adores our dog, and he is so patient with her! I laughed when you mentioned the food source because my daughter loves to say “more treats” because she likes the dog doing tricks, and he loves it because we have to give in! I have a 14 month old, and feel like I did not properly train my dogs to interact well with her. I finally feel like I am at a greater comfort level when she is around them, but I still get anxious. You’ve got some great tips here that I will remember. I totally understand Christy as a parent we are too busy with our new responsibilities that few things take a back seat. I hope these tips help you . Dogs are loyal yet they are animals and we need to work with them and our kids to build more trust. Such great ways to help bond puppy and baby. My puppy is so attached to me that it will be a hard transition for her! We also have plans to bring dog for my lil ones. Your tips will definitely help. Such an amazing post! Our dog was 3 when we had our first child, 3 years later and 2 kids later she is best friends with them. It’s amazing! So sweet and great you committed the time to making the transition easier for your pup! Our dog was used to kids and is very mellow, but now that my son is hitting his toddler time we have to make sure we are constantly teaching him to be gentle and respect her space. Dogs are part of the family! What a sweet relationship! My two year old is obsessed with our dog! I so love seeing her sweetness with him! Dogs are the best !